Plans for a new £1.1bn M4 relief road should not go ahead, Wales' future generations commissioner has said. The project's public inquiry starts next week but Sophie Howe believes the plan is "ill-conceived". 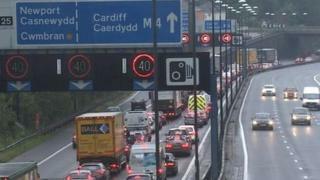 The Welsh Government wants to build the new motorway south of Newport to ease congestion via the Brynglas tunnels. The scheme has prompted objections from opposition parties, environmental groups and some Labour AMs. A large part of the cost will be met using the Welsh Government's new powers to borrow money. Under a law passed two years ago, Ms Howe has a legal duty to advise Welsh ministers on whether policies or government projects offer the best deal for future generations. In her submission to the public inquiry, she said: "I believe that using the Welsh Government's borrowing powers to finance one scheme that will, at best, result in geographically, economically and socially disproportionate benefits to one part of Wales is ill-conceived." She added: "Building roads is what we have been doing for the last 50 years and is not the solution we should be seeking in 2017 and beyond. "The rationale for a new road was conceived over 25 years ago with the main purpose of addressing congestion in the area. "I do not agree with the basic premise that this is the 'most sustainable, long-term solution to current social, environmental and economic problems associated with this route'." The legal duty to consider the impact on future generations - unique to Wales - means the Welsh Government should "explore other ways to address the problem", she added. Economy Secretary Ken Skates has previously said the inquiry would consider "all alternatives" proposed.